The origins of the city of Liverpool date back to 1207, when King John issued letters patent advertising the establishment of a new borough – ‘Livpul’. Soon after, in 1235, the building of Liverpool Castle was completed. This stood on the spot where the Victoria monument now is (on the aptly named Castle Street) and was removed in 1726. In its early days, Liverpool comprised of just seven streets, which are all still there today – Bank Street (now Water Street), Castle Street, Chapel Street, Dale Street, Juggler Street (now High Street), Moor Street (now Tithebarn Street) and Whiteacre Street (now Old Hall Street). It would remain a relatively small and unimportant city until its rise to prominence in the 18th century as part of the booming transatlantic trade. Liverpool FC’s origins lie with their neighbours Everton. Founded in 1878, Everton moved to Anfield in 1884, a facility owned by the club’s president, John Houlding, a former Lord Mayor of Liverpool. In 1892 a dispute arose between Houlding and the Everton board of directors, over the club’s tenancy of the ground. The annual rent had risen from £100 in 1884 to £250 in 1892; Houlding wanted to sell the ground to the club, which in turn wished to agree a long-term rental. Houlding would only agree to this on the basis of a rent at a level unacceptable to the club. Negotiations having failed, the directors decided to leave Anfield and find another ground, leaving Houlding with an empty stadium. His response was to form a new football club to occupy the stadium. He attempted to retain the team name “Everton” by registering the name “Everton Football Club and Athletic Grounds Company, Limited” with Companies House, but the Football League decided that the name belonged to the departed Everton club, which acquired new premises at Goodison Park. Houlding therefore adopted the name “Liverpool Football Club” for his new venture. Our away record against Liverpool is less than stellar. Our last win was on September 2nd 2012. 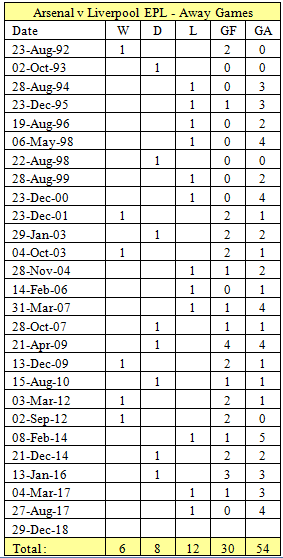 In the EPL era we have only won 6 league games in 26 attempts, and our overall league record including stands at 24 wins in 94 games. Our last game was a 4-0 thrashing, am I confident? – not in the least. Liverpool are this week’s Champions Elect what with City floundering. Since Liverpool last won the League title, we’ve won up at Anfield 7 times in the top flight (once in the old First Division and 6 times in the Prem) plus victories in both the FA Cup and the League Cup. There’s always hope when 22 men stand over a pig’s bladder in the middle of a field. Who knows, tomorrow could be our day! This entry was posted on Friday, December 28th, 2018 at 6:46 am and is filed under Uncategorized. You can follow any responses to this entry through the RSS 2.0 feed. You can leave a response, or trackback from your own site. 2-0 is the key. We should all watch 1989 again before Saturday! Otherwise, just pray the hotheads can keep control, Aubang and Laca can get two, and we can play with the discipline of the home game and the passion of the North London Derby. Morning all and thanks as always GN5. Its about time Liverpool winning run comes to an end. Back in 1989.having won the cup,Dalglish was favourite to complete the double.Then Arsenal 1989 was much better than Arsenal 2018. Of course there is no guarantee Pool will win though to be frank they are overwhelming favourites and why not. Their defence is the meanest.Arsenal’s goalie is a distant 2nd to the pool custodian. But then nobody gave the foxes and CP any chance of winning but by God/George/Emery they did. The trick is to make sure their Salah/ Sane and any Red is not given room and time. 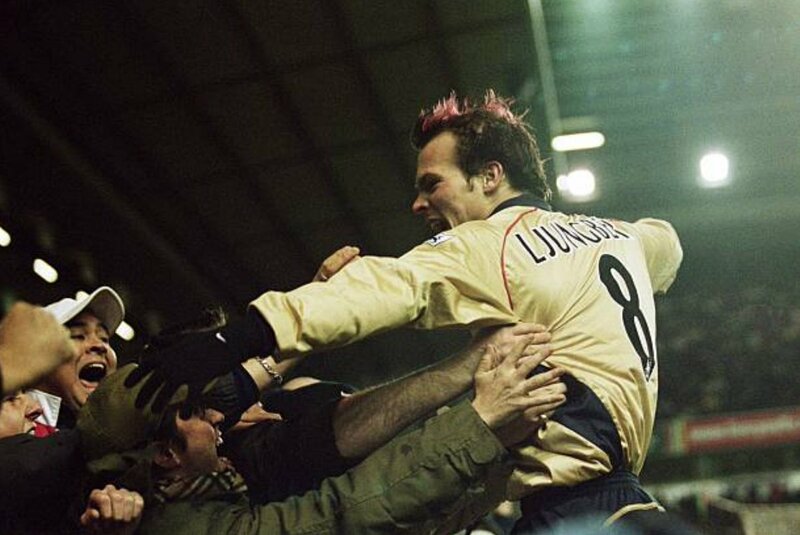 The gunners beat Spurs when nobody gave them a chance. Malaysian. I love the word “custodian”! And you are right, Leno is a distant second to the L’pool custodian. This is the difference between spending a world record fee on a CB and Gk and buying cheap defenders like we do. GN5. Thank you, as always. Fascinating about the origins of Everton/L’pool. After all these years of footie fandom, this is the first I have heard of it. Like our home game earlier this season, which we somehow failed to win, I expect Pool to demonstrate tomorrow how it has wasted precious money on its transfer business during hard times. 75m for a CB. a joke, IMO. Liverpool may yet win the league this season, but does it justify bleeding precious money? Just because it is someone else’s money? Does it bring sufficient financial returns and long run sustainability to the club? Does it bring enough joy for its fanbase to last a generation? On all those aspects, I think not, but I suspect I am in the minority. LBG and Malaysian. Cheers to your thoughts! Liverpool are an awesome team this year and look like they can also become invincible. We can “wish and hope” for a repeat of May 1989 but to me it’s most unlikely. They have the best defense in the league and I feel that combined with their attacking mentality (2nd best offense) will be far too much for Arsenal to withstand. We are far too vulnerable in defense, and our offense while creating many chances, often or not fail to put the ball in the net. Let’s face it our poor showings are not all down to facing great opposing goalies and biased refereeing. We are simply not in the same class as Liverpool, City, Spurs and Chelsea and it’s entirely possible that we will be overtaken by a resurgent Man U. Thank you for your comments, unsurprisingly I disagree! Investment, proper investment from a club in the top 10 of teams in the world (financially) is essential. So L’pool spent 150m more than us in just 2 seasons, and way more in the 2 seasons prior to 2017. Is it reflected on the pitch? Leicester were consistently good for the whole season they only lost 3 games and won the league by 10 points. Arsenal are a very different story and certainly not consistent. Blackburn were also a surprise winner but they are few and far between. Another fine piece of history. Anyone know what position Ben Sheaf plays? Saw him in training, but no Medley. Will get smashed-glad to see Mustafi back in training along with Mavro. None to soon for me. Oh, and if crystal palace and leicester can grind out wins against top teams, so can the Arsenal tomorrow! Hi Aaron, frankly I’ve never gave a lot of thought to Hill Wood he was our Chairman for many years, I do know that was instrumental in supporting the local area but I will brush up my knowledge and write a post for AA. I have not seen Ben Sheaf play but I remember that Arsene thought he was a good signing a few years back. Not for very long last night. Bit of a cold. Sorry to hear about your cold. Pack in the vit C with a glass of 5* cognac and you’ll soon be in rude health! No Mesut, so for me the horse for this course is Aaron just behind Laca and Aubang. Will Nacho and/or Mustafi be declared fit? Can we trust either in this circumstance in a rusty condition. Would even do so myself over Litchsteiner! If we have to play Xhaka, push him forward of Terrier and Ouzi and let Terrier receive the ball from the split centre backs. 2-0 was 40-1 three days ago. COYG.